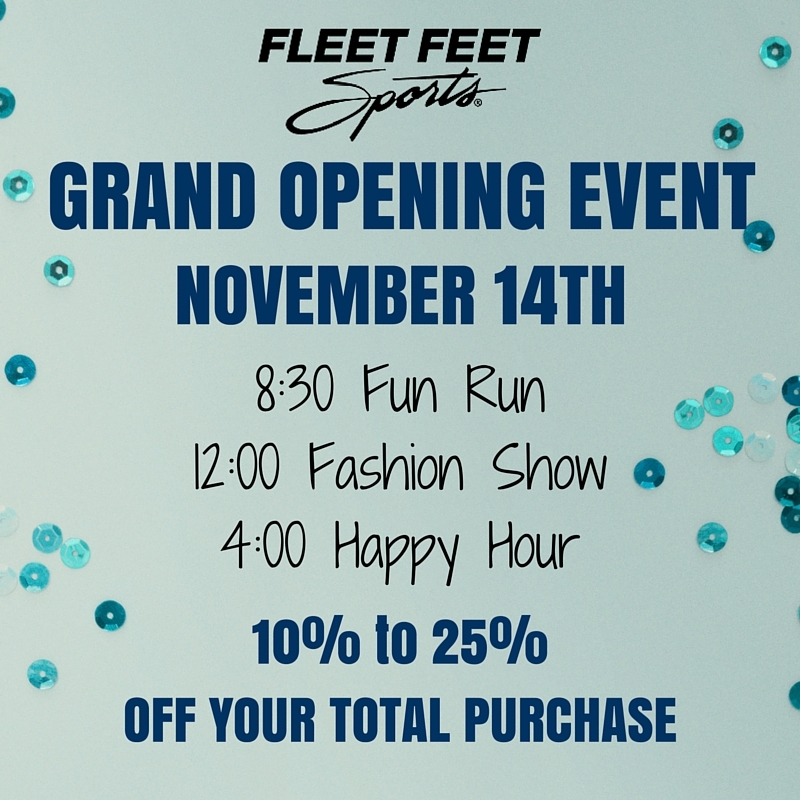 We'll be hosting a Grand Opening Event November 14th! We hope you can come celebrate with us. We have three key events planned on Saturday and we hope one, or more, appeals to you! Discounts and deals will run all day long! We're offering everyone at least 10% off. Have your try at three corn hole tosses and earn an extra 5% off for each successful toss (up to 25% off your total purchase)! Plus, we'll be raffling off three grand prizes for everyone who shops with us on Saturday. We'll have raffle prizes from Adidas, Oiselle and New Balance. Run our 3 mile loop, or more! Fleet Feet Sports and Adidas will each donate $1 for every mile you run to Four Diamonds. Record your miles by 10:00 and join us for some refreshments after the run. ﻿Check out the latest trends and hottest brands during our fashion show event. Please RSVP for the event for your chance to win a Oiselle Hoodie. Come enjoy some Happy Hour refreshments with us. Our special guest New Balance will be giving out two pairs of free shoes!